The National Retail Federation’s 2019 conference at the Javits Center in NYC is the largest retail tradeshow in the U.S. with over 37,000 attendees, 1,500 participating retail chains, and more than 600 technology exhibitors. “Brick and mortar” retail, perhaps more than any other, is a prime example of how edge computing is far more than a buzzword. Retailers across the world are trying to survive in an ecommerce world dominated by Amazon. Store fronts along with their corporate back-offices and supply chains are all trying to succeed by re-inventing themselves through digitization and immersive technologies. If you wanted to see how this is happening, the NRF 2019 show was the place to be. Both the Expo Hall and the marquee “Innovation Hub” offered a dazzling array of technologies and applications aiming to transform how retailers market to, connect with, and serve their customers. We saw in-store robots to guide you, digital signage of all shapes and sizes, “smart shelves,” real-time video analytics, virtual & augmented reality glasses, smart lockers, holograms, avatars to improve ecommerce experiences, and even mannequins that could magically change size to fit ANY body shape. Shopping in stores is going to become WAY more fun apparently. And beside the hardware tech, there was a seemingly endless supply of new software applications – many driven by Artificial Intelligence (AI) – to improve customer experience and to make the back office much more efficient and responsive. The future of brick and mortar retail certainly looked much brighter there in the Javits Center. IT resiliency is more critical than it used to be – No surprise here…success as a brick and mortar retailer increasingly relies on IT and networking. Everything going on in the store – from POS to digital displays to inventory management – must be up and running all the time, or at least as long as the store is open. This might require both a generator and a UPS. The UPS gives you the instant backup time needed to keep the IT going until the genset starts up. Or if a generator is not possible due to the size, cost, or environmental issues, another option might be to go with a UPS with long run lithium-ion battery packs that can buy enough backup time to get through most power outages. With IT being so critical, stores and supply chain edge computing sites should also consider adding in some redundancy to their critical infrastructure systems just as a centralized data center would do. Critical systems are likely to be spread out more versus consolidated into a single cabinet in a back office. Video cameras, displays, charging stations, smart mirrors, digital signage, etc. will be all over the store. Those devices should be protected and backed up where possible to ensure your customer’s experience remains uninterrupted. This might mean a larger UPS hardwired to the electrical panel so that circuits powering all the critical loads are backed up by the UPS’s batteries. Or it could mean multiple small UPSs located at the loads themselves. The distributed nature of the technology in retail stores also makes using a Transient Voltage Surge Suppressor (TVSS) a good idea. A single TVSS installed at the electrical service entrance of the building or store provides long-term protection against damaging power transients caused by nearby lightning strikes, downed utility lines, and other outside electrical mishaps. The experience of the technology should be visible, but not the tech hardware itself. Traditional IT infrastructure is industrial in nature and is placed in rooms where few people go. Retail stores, on the other hand, are showrooms designed to put its products and solutions in the best light possible. As a result, infrastructure systems needed in showrooms must be quiet, small, lightweight, and out of the way. This may cause us to rethink the architecture for how best to power and secure these devices. Multiple sites and lack of on-site technical staff creates unique (but solvable) management challenges. How do you engineer and configure a standardized infrastructure solution that works across all your sites? How do you deploy it quickly and predictably? Who’s going to service and maintain them? How do you keep unauthorized people from messing with the tech? How do you monitor all the infrastructure devices across all the sites in a way that isn’t overwhelming or confusing? 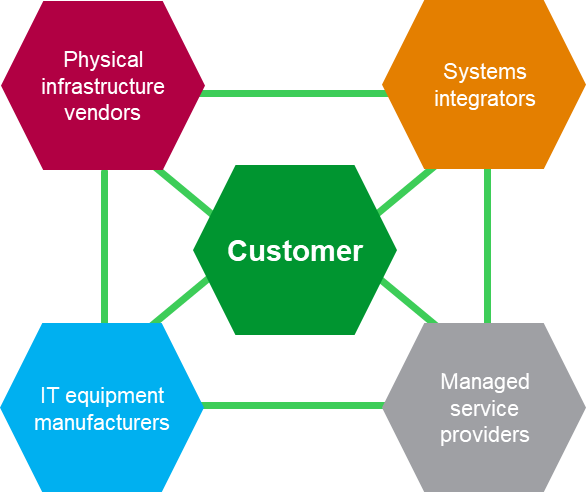 To address these questions effectively, there needs to be a collaborative ecosystem comprised of vendors, integrators, ITE manufacturers, managed service providers and, of course, the end customer. Infrastructure vendors and IT equipment manufacturers develop solutions that work well together and formulate tools and configurators that make it easy for people to create a standardized solution right for them. Integrators build and deploy the system together with the end user. MSPs are critical for their ability to manage and maintain these systems over time, over many places. It is also incumbent on the vendors to build the management tools and digital services that empower the MSPs and end users to keep on top of everything so that their customers’ experience remains flawless and things are done efficiently. For example, to solve these unique edge challenges, APC has developed configuration tools, digital services, and cloud-based software management tools, while fostering and supporting this collaborative ecosystem. So, for retailers who were not able to make the NRF show this year or for those who were and want to learn more, APC can still help you decipher edge computing for your next digital transformation project. Just click here to learn more.